Besides obviously wanting to win a game against your opponents, one of the key things players want in Heroes of the Storm is to gain more gold to purchase playable heroes. All of them are of course obtainable for RL money, though it would be very expensive to constantly pay for them with your hard earned cash. Playable Heroes can also be purchased with in-game gold but earning it in substantial amounts can be a very time-consuming process, something which the game has been quite criticized about. If you’re a new player and don’t have any heroes unlocked, you are restricted to playing 5 characters which rotate every week (or 7 with certain account-wide levels). Permanently unlocking a Hero will require either Gold or real-world money, and unsurprisingly most players much prefer the free option. In the guide below we’ll take a look and provide more insight into how each of these ways works and how you can maximize your gold gains! Simply by playing games, your HotS account also receives experience and levels. It’s referred to as “Player Progression”, and there are a total of 40 levels your account can achieve. Each level will require progressively more experience. An average “Cooperative” game (against A.I. controlled bots) will net you around 60,000 experience, and it will take hundreds of matches played to reach level 40. Leveling your account is essentially done passively just by playing lots of matches, but certain levels are very important to achieve. On level 6 you will unlock daily quests, which are the bread and butter of gold-gains in this game. 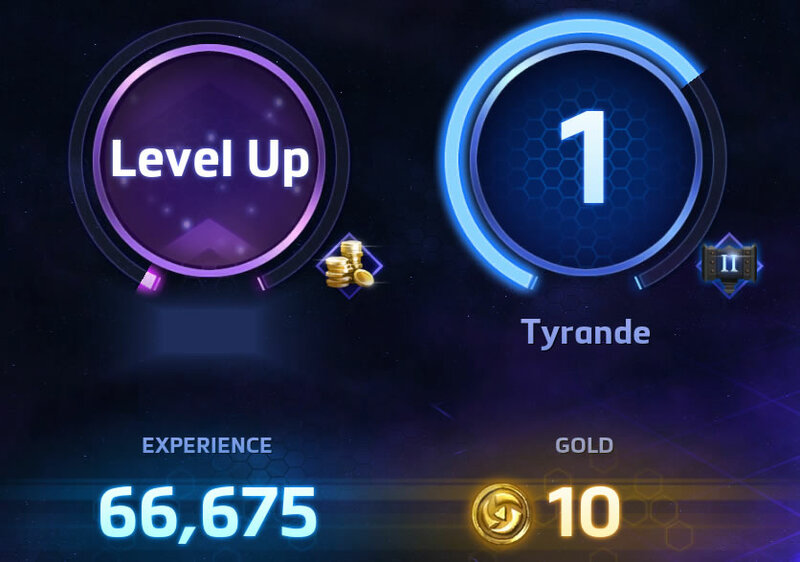 At level 10 you get a free 7-day Stimpack, boosting your experience and gold gain substantially for every match you play. You will get a free Stimpack at level 7. Put it to good use! Considering this is the first and only free Stimpack you will get it’s very important to use it wisely. Meaning, for the next 7 days you will want to play as many matches as you possibly can. Cooperative game wins will net you 25 Gold instead of the usual 10 (150% increase), and while it doesn’t seem like much it adds up after a few dozen (or hundred) games during that week. Furthermore, the experience your Heroes get for playing a match is doubled, so this is the perfect opportunity to play as many different characters as you possibly can and get them to level 5, therefore getting 500 extra Gold each time. It will take about 8 matches played with every Hero to bring them up to level 5 with an active Stimpack, so try to play every hero available during the weekly free-to-play rotation, even if you don’t like their playstyle. With “only” ten level 5 Heroes you could get extra 5,000 gold! There’s not much to talk about here: just by playing and winning games you gain more gold. This is a passive way to get gold, and just by playing a few matches per day you can eventually get enough gold for some cheaper champions, though it will take quite awhile. Simply playing games gives you XP and gold? Preposterous! For new players and even others who play certain Heroes for the first time, Cooperative games are a great way to quickly grab a few wins and more experience. The matches will rarely last longer than 20 minutes, and it’s highly unlikely you will lose any of them. For Co-Op games you gain 10 gold per win, and for competitive Quick-Match mode you get 30 gold per win or 20 per defeat. Leveling all Heroes to 5 is an easy way to grab extra gold. 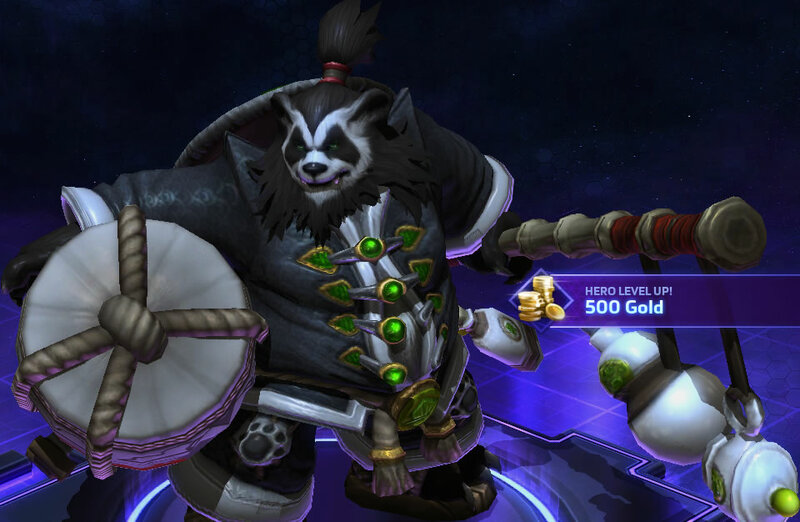 As mentioned above, leveling every Hero in the game to level 5 will give you a one-time boost of 500 gold. 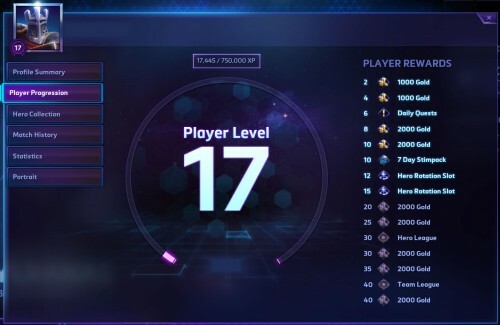 At the time of writing this there are 35 Heroes in total in Heroes of the Storm, which means you can get 17,500 gold just for reaching level 5 with each of them. Reaching level 2 requires 100,000 XP, reaching level 3 and 4 the same, and from level 4 to level 5 you will need 475,000 XP. 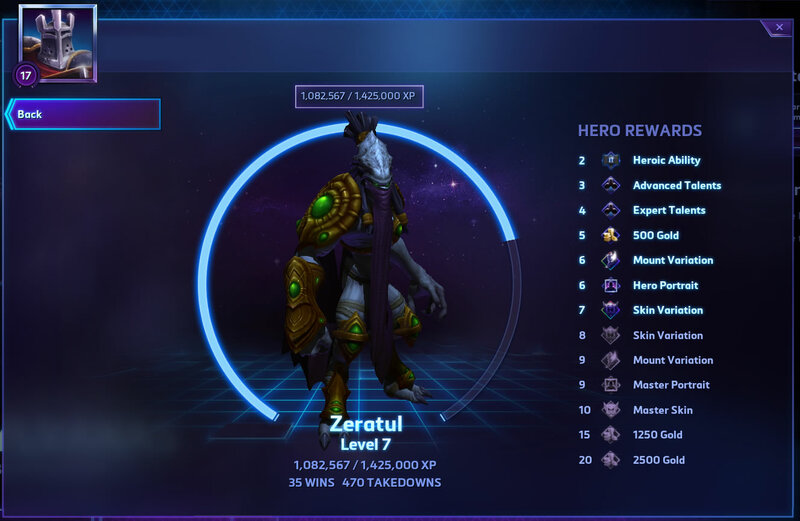 So, a total of 775,000 XP is needed to get a Hero to level 5, which equals to an average of 6 Cooperative games with an active Stimpack, or 12 games without. Losing against bots in Co-op mode is unlikely to happen so this is a great way to learn the basics of new Heroes, unlock all of their Talents, and get some experience and gold in the process. At Hero levels 15 and 20 you also gain gold rewards: 1250 and 2500 gold, respectively. Though it will take a bit longer to reach those levels, when you truly fall in love with a particular Hero you will have no trouble reaching it eventually. You can have up to 3 daily quests in your log at the same time. You can have up to 3 daily quests active at any given time: even if you don’t complete the quest today, it will remain in your Daily Quest log until you do. I love this system as I don’t necessarily have to “force” myself to play every day if I can’t find the time, I can just log in to grab the quest and complete it some other time. On average you get 355 gold per quest, which require you to play an average of 3,5 games (assuming you always win). Note: you may need the level 12 and 15 Hero Rotation Slots unlocked, otherwise certain Hero archetypes will not be available to you in the weekly free-to-play hero rotation. If you played for a month every day just to complete your Daily Quests, it would take 105 games and net you 10,650 gold. 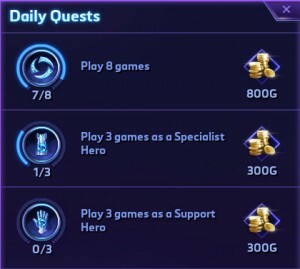 As you can see objectives of some quests also overlap, so if you keep 2-3 quests in your log all the time you would play even less, averaging to about 3 games a day. For casual players who only want to play for about an hour every day, this is an amazing system and will allow you to purchase at least one Hero a month (prices vary from 2,000 to 10,000 gold per Hero). If you want a quick win and don't want to risk seeing this screen, play a Cooperative match. That of course doesn’t take into account gold bonuses from leveling your account or certain Heroes! 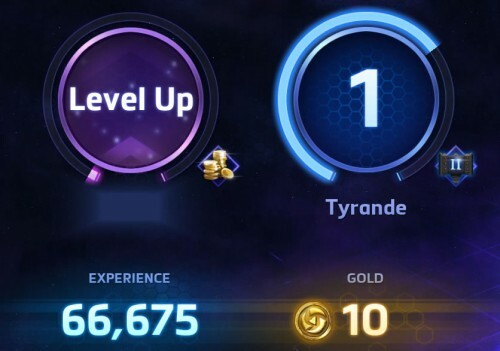 Playing 105 Cooperative games would give you another 1,050 gold, and assuming my calculation about an average of 6 co-op wins needed to reach champion level 5, you would have 17 level 5 Heroes each awarding you with 500g, or in other words another 8,500 gold. TL;DR: Playing Co-op games for 30 days every day and completing daily quests with different free-to-play Heroes would get you 20,200 gold. Depressing fact: 35 currently available champions to purchase cost a total of 223,000 gold. That’s 11 months of daily quests and 1150 matches played! Assuming an average match time of 18 minutes, it’s 345 hours or just over 14 days spent playing. Valla is a cheap, viable, and most importantly fun hero. 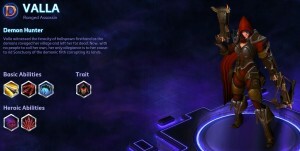 If you played a Demon Hunter in Diablo III, you will love her! You don’t need all Heroes unlocked to play ranked. In fact just buying a dozen of them is enough to jump into competitive play. Below is a quick list of viable heroes and their prices! This is by no means a must-have list, rather a good starting point for new players with current top-tier heroes. Note that hero viability may change with various patches and nerfs. Purchasing all of the above heroes would cost a grand total of 80,000g. Consider purchasing a Stimpack early on. 7-day Stimpack costs $3,99, and 30-day Stimpack is $9,99. For the price equivalent of a 30-day Stimpack you can purchase only one 10,000 gold Hero, making Stimpacks a much better investment if you intend to play a lot during that month. You will probably make up most of the gold to purchase said hero, but also gain double the usual experience. Grouping up with other players gives you a 50% XP bonus. If you don’t have any, just add a few good ones after a match and queue together with them. 50% XP is a fixed bonus regardless of party size. Don’t purchase champions before you try them at least once. Their abilities or theme may seem appealing at first, but you may end up disliking their gameplay after awhile. Try to level them up to level 4 at least and see all of their talents before you make the purchase. You cannot have 2 identical quests at the same time. 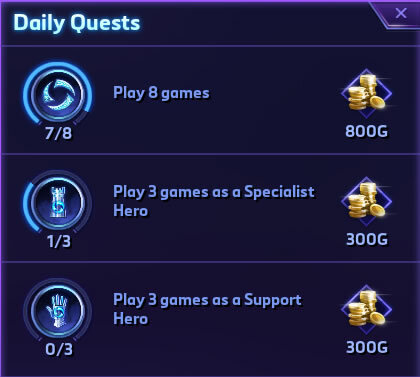 An interesting tactic is to try and avoid completing low-value quests (like “Play 2 games as a Warcraft hero” for 200g) for as long as you can, making sure your quest log always has 2 low-value quests. This increases your chances of getting a higher value quest (600g or 800g ones). It can total to about 45 extra gold per day. Never buy heroes the first two weeks after release. Their initial release prices are set to 15,000g, but are reduced to 10,000g after two weeks. They may seem awesome and fun, but a bit of patience can easily save you a substantial amount of gold. Best way to get more gold is to consistently win games. 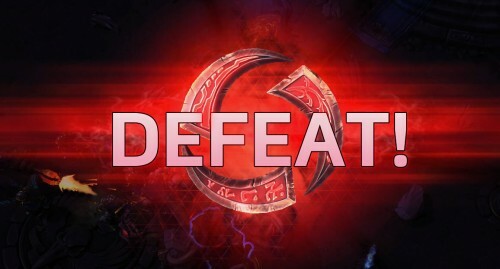 If you want to keep your win ratio above 60%, be sure to take a look at these guides. Learn best kept secrets for climbing the ladder quickly! 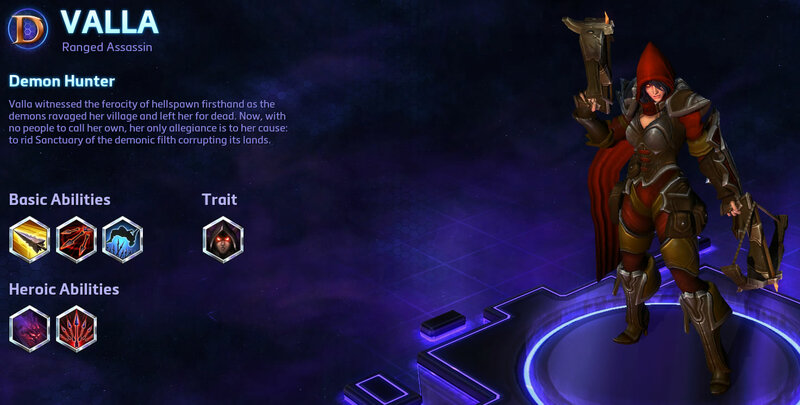 For casual players Heroes of the Storm has a lot to offer. Grinding gold by playing countless matches is viable, but Daily Quests are your main source of gold gain. Despite players being very vocal about stingy gold gains in HotS, the game’s main competitor League of Legends requires far more matches (which are also far more frustrating, and last twice as long) if you wanted to unlock every Hero. Of course, you absolutely don’t need to unlock every hero to play Heroes of the Storm, even if you intend to play Ranked games exclusively. The ranked Hero League game mode requires you to have at least 10 heroes unlocked to even play it, and some of the most popular and powerful ones aren’t in the most expensive 10,000 gold price tier. In fact you’d need only about 70,000 – 80,000 gold to unlock viable ranked heroes, which you can farm in just 4 months of very casual play time.